Basic Food Group employs rock trio instrumentation to investigate new combinations of musical genres. Compositions are scored in detail with sections allowed for improvisation. Over time the work is "pureed," that is, reworked and rearranged by the entire band, with elements of the music scrambled and shuffled, and new influences added. We approach it as if we were playing electric chamber music, yet each piece might include combinations of latin, reggae, rock, punk, funk, avante-garde or classical forms. The music has three equal parts, with each instrument playing a different, often non-traditional role. We intend to challenge ourselves and the audience through the twisting of familiar genres into new hybrids. Basic Food Group began as a side project for Todd Larson while studying at Minneapolis College of Art & Design. Assembled to perform a new musical improvisation in 1986, the first gig included an additional drummer (Rob Foy), guitar player (Paul Vachon) and saxophonist (Hall Sanders). 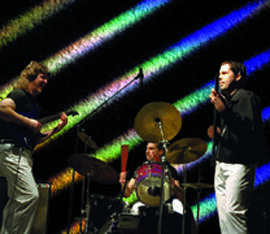 Past members include Mike Bruns (guitar) Ben Glaros (guitar) and Vernon Norwood (drums).